Steven Monacelli, Associated Student Government's vice president for community relations, speaks in support of passing the resolution, "Students Support Gun Control," at Wednesday's Senate meeting. The resolution, which encourages Congress and President Barack Obama to work together on legislation to reduce gun violence, passed shortly after. After a nearly four-hour long meeting with much debate, Associated Student Government passed a resolution to recommend divesting from the coal industry and another to support improved gun regulations. Senators passed the resolution “Establishing Northwestern as a Global Leader in Environmental and Financial Sustainability” with less debate than last week’s meeting and an overwhelming majority. The resolution recommends to Northwestern administrators a complete divestment from the coal industry, a decrease in future investments in fossil fuels and more investments in clean technology and renewable energy. ASG’s associate vice president for sustainability Mark Silberg, a Weinberg junior and one of the resolution’s authors, said the number of sponsors increased from 55 to about 70 in the past week. Senators also passed a resolution urging Congress and President Barack Obama to work together on legislation to reduce gun violence. It also states that the NU student body supports improved gun regulations. Senators passed an amendment that changed the legislation from supporting the “President’s executive orders regarding improved gun legislation” to its current form, which supports only improved gun regulation. This amendment was made to temper the partisan nature of the resolution, said senator Jane Gilmore, a Weinberg junior. Senator Evan Frohman, a Weinberg freshman, proposed another amendment that replaced “Northwestern student body” with “Associated Student Government.” ASG Vice President Brad Stewart supported the amendment, but other senators opposed it, stating that ASG’s role was to speak for its constituents. 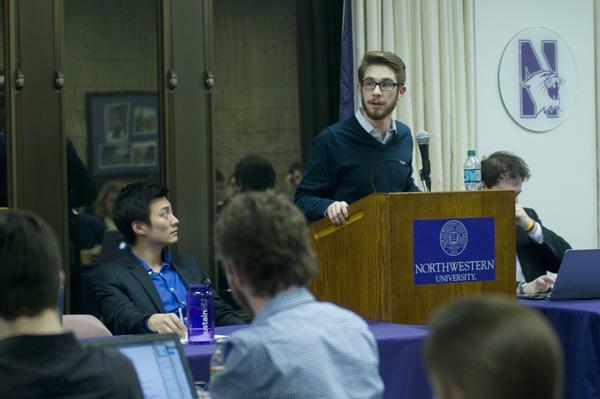 “Northwestern student body and ASG equal each other,” said senator Chris Harlow, a SESP freshman. The amendment failed with a vote of 12 to 16 and seven abstentions. Debate over the resolution continued as some senators were concerned with the resolution’s legitimacy in advising the U.S. government. ASG President Victor Shao intervened with a statement supporting the cause. The bill titled “Ad-hoc Committee on Gun Control” was also passed. This will create an ad-hoc committee of five ASG members, who will be elected Wednesday, to write an open letter to Congress pressuring them to make a bipartisan movement on gun control. Another proposed resolution, “Political and Partisan Issues,” which stated that ASG should remain silent on national and political issues that do not explicitly relate to students, did not pass. The second bill addressed at the meeting, “Student Groups Vice President & Financial Vice President Selection Committees,” did pass. It lists logistics for appointing the next vice president for the Student Groups committee and the next financial vice president. At the end of the meeting, senator Jesse Seitz, a Weinberg junior, proposed creation of a legislation that would not allow Senate to extend past three hours. The legislation may be introduced next week.